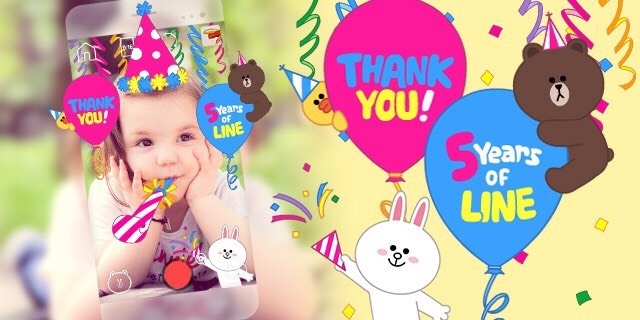 Tokyo, Japan – June 22, 2016 – The LINE messaging app celebrates its fifth anniversary since service launch tomorrow June 23. In conjunction with this five year milestone, LINE is undertaking a complete redesign of its corporate site*1 based around its new corporate mission “CLOSING THE DISTANCE,” and conducting a special fifth anniversary campaign. During the campaign, users will be able to buy over 30 different LINE character sticker sets at half price, and make unlimited, free calls to domestic and international landlines and mobile phone numbers (for up to 10 minutes per call) using LINE Out. The company hopes users will take the opportunity to feel closer to the people in their lives who truly matter. The LINE app was launched on June 23, 2011 as a service for enabling better communication with friends, families, loved ones and other people who really matter in people’s lives. LINE not only has users in Japan, but also has achieved remarkable success in Thailand, Taiwan, Indonesia and other regions of Asia, winning support from people young and old, male and female alike as a service that goes beyond a simple communication tool, providing means for more intimate means of connection. Providing one-to-one and group real-time chats, stickers for expressing emotions hard to express in words, free audio and video calls, and other features that enrich the communications of users, the app achieved a rapid expansion in users, particularly in Asia. LINE has since further expanded its features, including LINE Out, a service that provides low-cost calls to domestic and international landlines and mobile phone numbers, and LINE Pay, a mobile payment service that makes paying at affiliated vendors and stores easier, and that enables users to send and receive money from each other. Backed by a strong user base and high activity rate, LINE is also pushing ahead with a “Smart Portal” platform strategy. In this Smart Portal, LINE will act as the gateway to a vast array of information and services, both online and offline—services including LINE LIVE, a live video streaming service with real-time interaction from users, LINE MUSIC, an on-demand music streaming service that allows users to use music as a spark for communication, and egg, a selfie app that users can play with not just during the uploading process, but also during the photo-taking process. Under its mission “CLOSING THE DISTANCE”, the company will continue to drive the mobile market forward as an Asia-based communication platform, actively providing new services, furthering its expansion globally, and undertaking new initiatives to enrich the lives of as many users as possible. Over 30 sticker sets featuring Brown, Cony and other LINE characters will be sold half-off. During the campaign, unlimited LINE Out calls to domestic and international landlines and mobile phone numbers will be free for up to 10 minutes per call. For one month’s time, users can play with free animated stickers displaying an anniversary message along with Brown and the other LINE characters.